Hundreds of consumers are being ripped off by ticket resale sites. It's time to clean up the market. The latest on our campaign against ticket resellers. Price caps on resold tickets are among measures announced by the government to finally rein in ticket scalpers. Consumer NZ is welcoming the Commerce Commission’s announcement it’s taking ticket resale website Viagogo to the High Court. 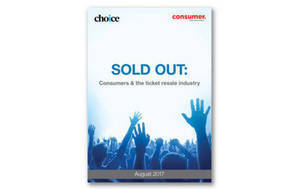 Inflated prices, hidden fees and misleading sales tactics have been identified as major problems in the ticket resale market, in a joint investigation by Consumer NZ and Australian consumer group Choice. Consumer NZ is joining forces with consumer groups in Australia and the UK to investigate complaints about ticket reselling sites such as Viagogo and Ticketmaster Resale. More than 1000 consumers shared their experiences for our investigation of ticket resellers, such as Viagogo and Ticketmaster Resale. Read the results of the investigation in our report Sold out: Consumers & the ticket resale industry (1.14 MB).